When Rachel Orlomoski ’17 entered Clark University in 2013 with the goal of studying biology, she was a little dubious about chemistry and math. You could say those weren’t exactly her favorite subjects at Woodstock Academy in Connecticut. But after three years of studying and conducting research at Clark, Orlomoski has learned to appreciate both disciplines. She applies them to her biology research, and she has added a chemistry minor to her biology major. Now a senior, the Traina Scholar is one of six undergraduates and three graduate students working closely with Robert Drewell, an associate professor of biology who is affiliated with the Biochemistry and Molecular Biology Program. They are members of an interdisciplinary team with Drewell’s research collaborator, Jacqueline Dresch, assistant professor of mathematics. cellular development echoes that of humans. Orlomoski is working on Drewell and Dresch’s three-year developmental biology research project, which is funded by a $450,900 National Institutes of Health Academic Research Enhancement Award (AREA R15) program grant. The two professors are investigating how genes regulate the cellular development of animals, from a single cell to billions of cells. 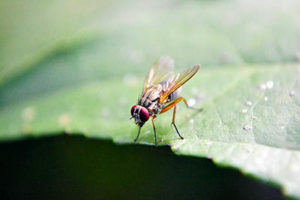 They study the process in fruit flies, Drosophila, because it echoes human development. Recently, Orlomoski’s research project has broadened to include work in the chemistry lab of Donald Spratt, assistant professor of chemistry and biochemistry and Carl J. and Anna Carlson Endowed Chair in Chemistry. Orlomoski’s research deals with the FTZ protein, which binds to the DNA of Hox genes. Such genes, which are also found in humans, control the embryo’s development from head to tail. FTZ helps promote, or activate, the process through which genetic information is transcribed into the RNA copy. These RNA molecules are translated into proteins, the building blocks for almost everything in the living organism. Because Spratt’s research also deals with proteins, his lab includes special equipment that allows Clark faculty and student researchers to purify and analyze these molecules. The equipment includes a high-speed centrifuge, fast-performance liquid chromatography (FPLC) and a nuclear magnetic resonance (NMR) spectrometer. Professors Drewell and Dresch’s labs. We recently caught up with Orlomoski to ask about her research experience and what she plans to do after college. Why were you interested in coming to Clark? The small size and focus on research drew me to Clark. I’m relatively shy, so I wanted a school that had smaller classes and professors who would be able and willing to help individual students, one on one. I didn’t want to be too far from home, but I wanted to experience something different than what I’d been used to (small-town life), and Clark was a good match for those things as well. Did you know what you wanted to major in when you arrived at Clark? Or were you influenced by a classroom or other experience here? I knew that I wanted to study biology and participate in research during my time here. I became interested in biology in high school, and I started to consider cancer research as a possible career option during that time as well. But when I first started at Clark, I had no idea that I’d end up taking so many chemistry classes and adding a chem minor. I’d been awful at chemistry in high school, and I’d hated it. But the experiences I’ve had in my chemistry classes at Clark have been mostly positive and have really challenged me and pushed me to excel. I overexpress [make copies of] the FTZ protein using E. coli bacteria and then work to isolate and purify it. My protein is a DNA-binding protein. I’ve had to do a lot of trouble-shooting so far, and I’m still working to find a protocol that will purify my insoluble protein. Once I have a pure protein, it’ll be used to do binding assays [a procedure that allows researchers to measure interactions between molecules] in order to physically determine the binding affinity with various target DNA sequences that we’ve chosen. What has surprised you most about doing research? I was most surprised that not everything in research turns out like you would expect. Research isn’t straight-forward; there’s a lot of trouble-shooting, seeing what works and working through the negative results. I’d always heard that research was difficult, but until I actually started doing it, I never really understood how true that was. What is it like to work for Professor Drewell? He’s relatively “hands-off” in terms of the actual lab work, but he’s very helpful whenever a problem is encountered. 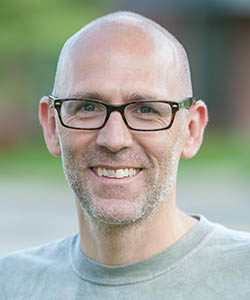 Professor Drewell wants his students to learn how to make some decisions on their own, as the ability to work independently is an important part of doing research. During lab meetings, he challenges his students by asking them to explain a concept or consider another approach. He’s very passionate about what he does, and you can see that in the way he runs his lab. He’s relaxed in his teaching style, but he pushes his students to put forth their best effort to produce good work. He doesn’t appear to be discouraged by setbacks; instead, he looks for a solution and moves forward. Can you talk about the interdisciplinary aspect of working on the Drewell-Dresch grant? It’s interesting to see how biology and math can be combined in an easily understandable way. I think a major success of the collaboration between the Drewell and Dresch labs is that biology students have learned a bit about practical applications of math, and vice versa. A stereotype of biologists is that they’re generally terrified of math and avoid it whenever possible, and that’s been relatively true for me since I started college. But seeing how Drewell and Dresch explain math in relation to biology has dissipated some of my distaste in the subject. Although looking at a problem from two different viewpoints will inevitably reveal more options to consider, it’s important to look into all those options, especially in terms of a research project. Research requires a lot of forethought and planning, and considering how to look at a problem from both a math and biology perspective is extremely useful. What has the experience been like, and how might it help you with your goals? Doing research at Clark has shown me that I’ve chosen the right career path. Yes, research can be time-consuming and frustrating, but it can also be incredibly rewarding. Research has helped me to become more confident in my abilities and has challenged me in a way that no class ever has. It’s taught me time management and planning, perseverance and problem-solving. I think that my research experience at Clark will help me adapt to life after graduation, in terms of my career and general independent adult life. After graduation, I plan on doing Clark’s fifth-year program in biology. Afterward, I would like to start a career in medical research. I’ve been particularly interested in studying cancer since high school, and I would love to be able to do research in that field.